I made this cake for an old friend at work who was leaving England for Brazil. 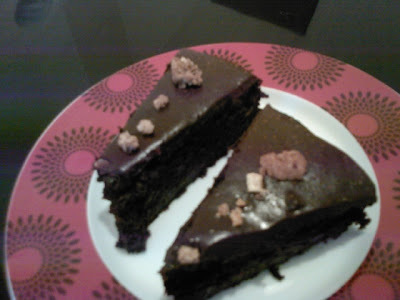 This simple chocolate cake is a recipe by Hersheys that i have slightly modified. 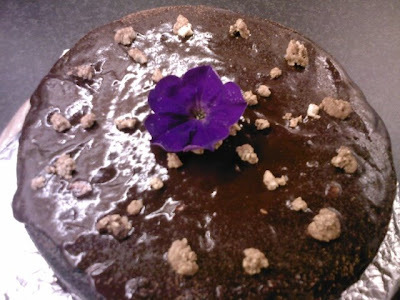 I made it special by topping it with dark chocolate ganache and cruchy oat clusters. 1. Heat oven to 350°F/ 175C. Grease a 23 inch round cake pan. 2. Stir together sugar, flour, cocoa, baking soda and salt in large bowl. Add eggs, buttermilk, coffee, oil and vanilla; beat on medium speed of mixer 2 minutes (batter will be thin). Pour batter evenly into prepared pan. 3. Bake for 1 hour and 10 mins or until wooden pick inserted in center comes out clean. Cool for 10 minutes; remove from pan to a wire rack. Cool completely. 1. Melt the chocolate and cream on the top of the double boiler until satiny smooth. 2. Remove from the heat and add in the liquer and beat well. Spread the icing over the cooled cake. 3. 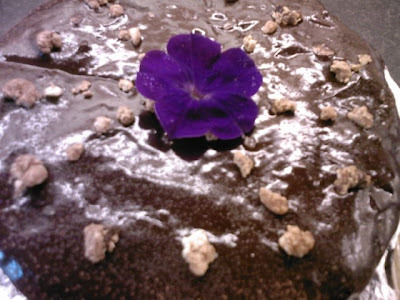 Decorate with crunchy oat clusters and an edible petunia flower and cocoa dusting. Flower fact: The Petunia hybrida or the common garden petunia is edible. These flowers are mild tasting and you can also use them as a garnish on salads. For more on edible flowers. i can succeed. best of success in your culinary adventure. is its creator? wonderful indeed! Thanks dad. Im sure you will bake a great cake. That is a caricature of us.We got it done at a fair in wimborne a few weeks ago. Im glad you like it.